Logitech and Zoom are proud to announce a fully-integrated Zoom Rooms solution that delivers on the promise of simplified, easily scalable video deployments and seamless user experiences. 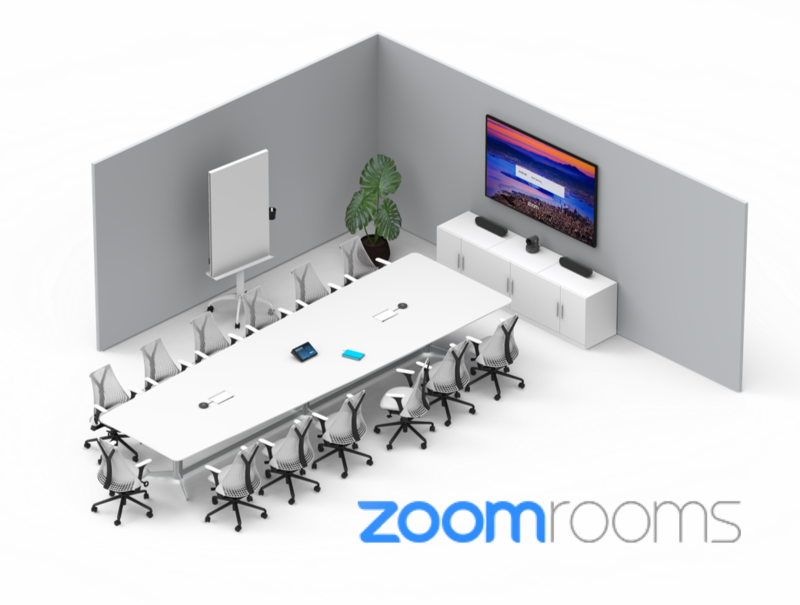 Certified and natively supported by Zoom, Logitech Room Solutions now provide a comprehensive suite of components to power Zoom Rooms from huddle spaces to large conference rooms. Logitech Room Solutions are comprised of the all-new Logitech Tap touch controller, a small form-factor Intel NUC, in-wall rated cabling, and a select Logitech conferencecam system optimized for small, medium-sized and large conference rooms. Logitech Tap combines one-touch simplicity for users with IT and AV-friendly features like multiple mounting options, a 10-meter Strong USB cable, and robust cable retention mechanisms. To enable a wide range of deployment options, an optional 25-meter cable is also available. Through the organizations’ tight engineering partnership, Logitech Tap has been optimized to support the Zoom Rooms interface and includes an integrated HDMI connection that simplifies wired content sharing, as well as Zoom’s native wireless proximity sharing via ultrasonic device recognition. Logitech Tap provides an improved approach to touch control over tablet-based room systems, which can suffer from battery loss and device management challenges. Both Logitech Tap and the select Logitech conferencecam are anchored by a Zoom-qualified Intel NUC PC, pre-imaged with Windows-based Zoom Room software also inclusive of device mounting, cabling and simplified set-up instructions. Logitech Tap with Zoom Room Controller, including various Mounting Options. With Logitech Tap, Logitech and Zoom have created an IT-centric video collaboration solution that optimizes the Zoom Room experience for deployments at scale, while delivering happier meetings for every participant. Logitech Room Solution Packages for Zoom Rooms include all necessary components in one package: the Logitech Tap touch controller, a small form factor computer pre-installed with Zoom Rooms, and a Logitech conferencecam system. These solution packages are planned to be available globally from Logitech distributors and resellers in Spring 2019. The packages are scheduled to be in the price range of $3000 for small rooms, $4000 for medium rooms, and $5000 for large rooms. Logitech Tap is on display this week in Amsterdam at ISE 2019, the world’s largest AV and systems integration show. Visit Logitech in booth 11-C110 to see Tap in action. You can also pre-schedule a meeting with Logitech by clicking here or learn more at www.logitech.com/Tap.